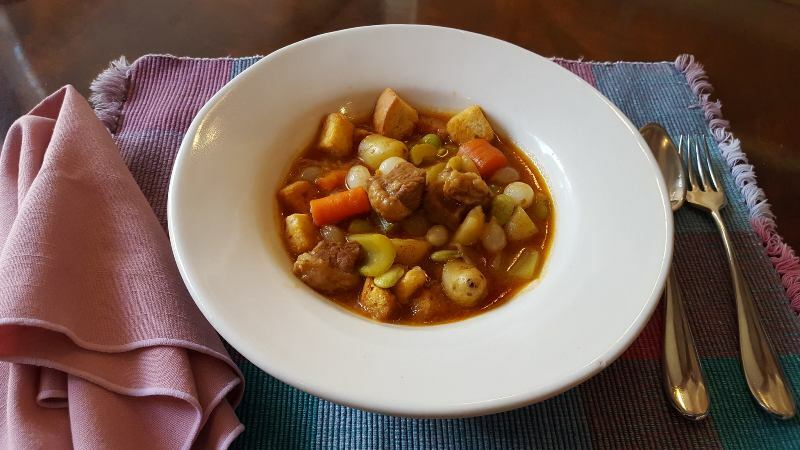 This blog post is about a beef stew recipe that I created after a bit of online research, and how I made a beef stew for Sunday dinner. 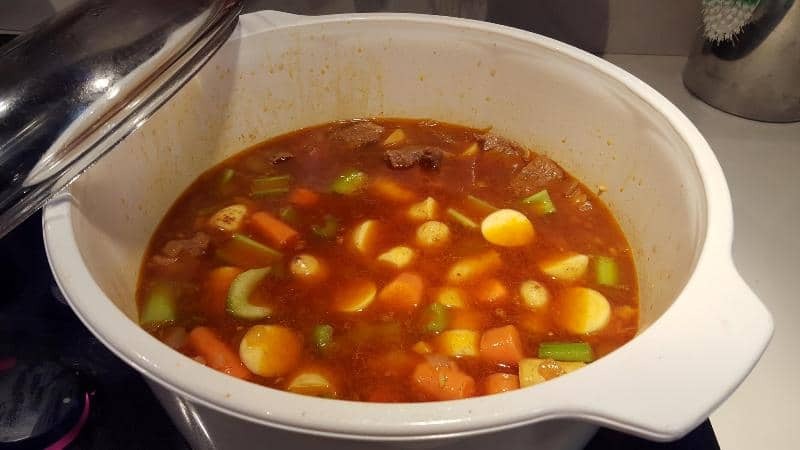 Google “beef stew” and read through a few recipes. You’ll get a sense of the measurement of the ingredients. Pick your favorite recipe or a combo of a few. It’s pretty easy to come up with your own take on this hearty recipe. TIP: Always read all of the way through any recipe(s) and get your ingredients ready before you start cooking. … and 4 cups of broth (beef or vegetable), 1/2 can of tomato paste, and 3 to 4 tablespoons of olive oil. You see how I diced all the carrots, celery and potatoes to be pretty much the same size. That’s so they cook evenly. 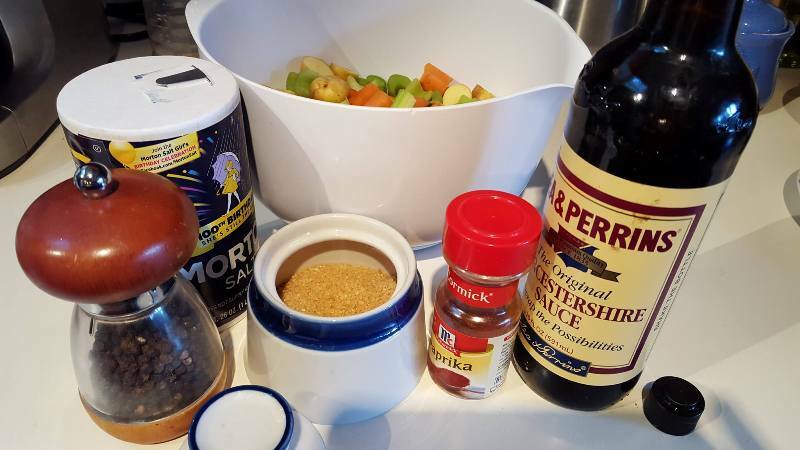 Here are a few more ingredients; 1 teaspoon of salt, fresh ground black pepper to taste, 1 and 1/2 teaspoons of sugar, 1 teaspoon of paprika, and 1 tablespoon of Worcestershire Sauce. 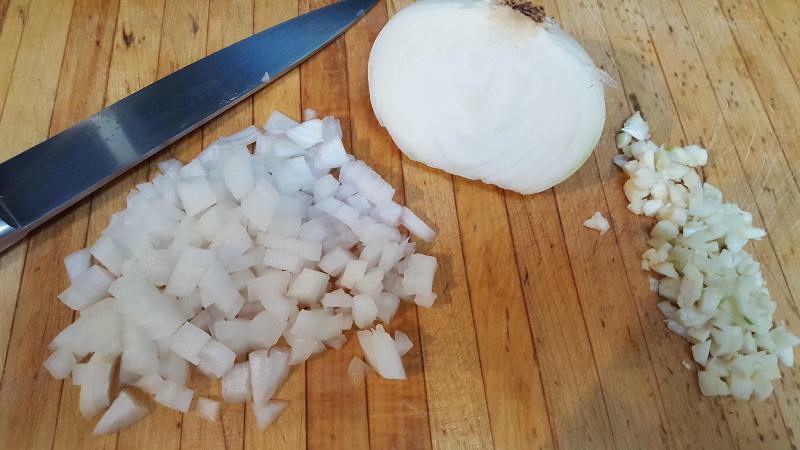 You’ll want to dice the onion and the cloves of garlic. You’ll need a large pot, or a dutch oven. Add your olive oil to cover the bottom of the pot, heat the oil, and brown the beef. 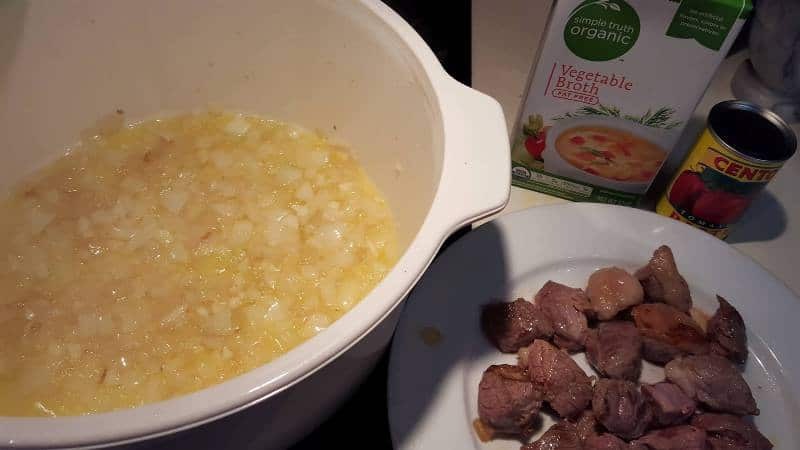 Once browned, remove the beef from the pot, and throw in the onions and garlic, and cook until softened, a few minutes should do it. 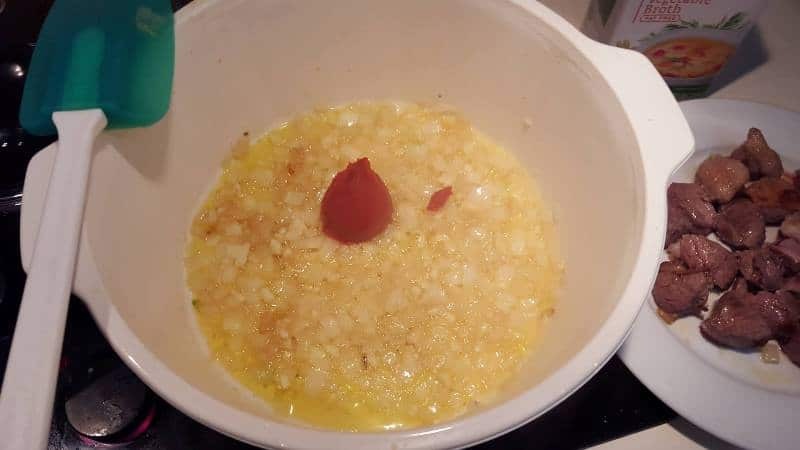 When the onions and garlic are translucent, add the tomato paste and stir, then pour in the broth and continue to stir until all the ingredients are mixed well. Oh! I almost forgot! 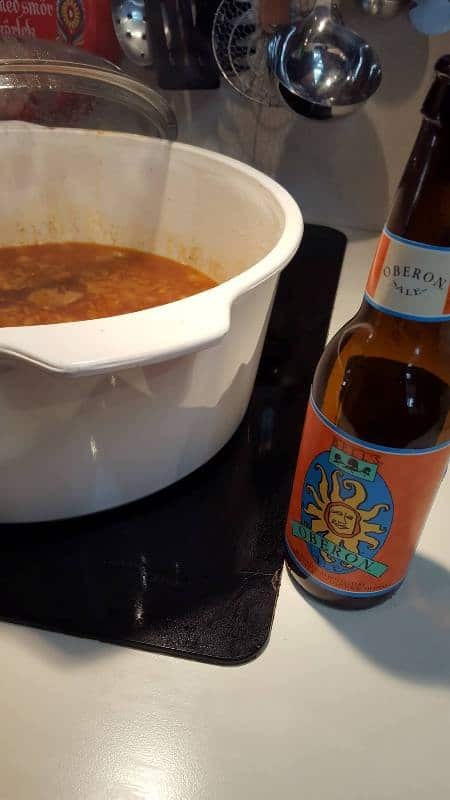 I added a bottle of Bells Oberon beer too. Pick your favorite bottle of beer. Return the beef to the pot, cover and simmer on low heat until the meat is tender, 1 and 1/2 to 2 hours. Add the veggies and continue to simmer until the veggies are tender, about 20 to 25 minutes. This is where I embellish my recipe just a bit. 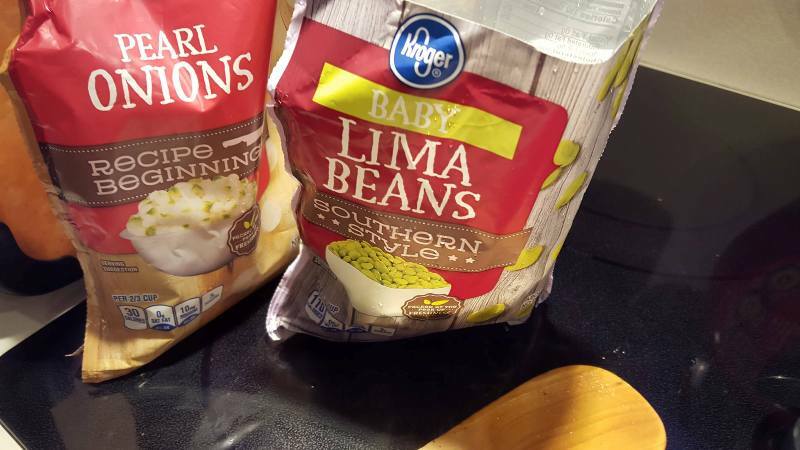 I add frozen pearl onions and Lima beans. Keep simmering another 5 to 10 minutes, until the frozen veggies are cooked through. 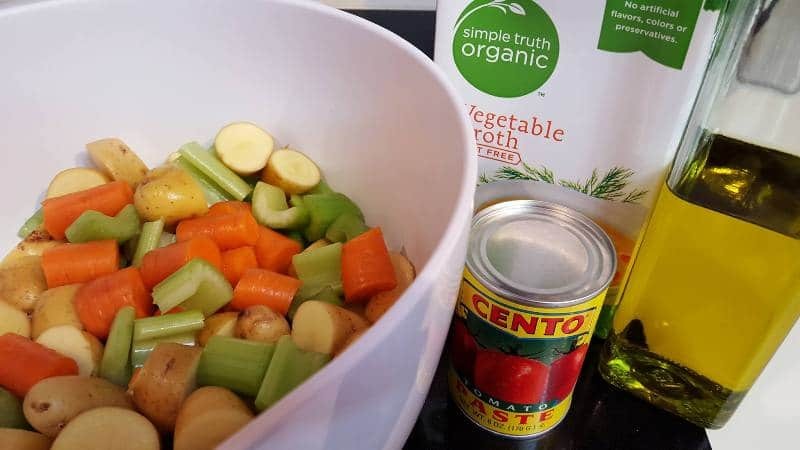 If your broth is too thin at this point, remove a cup of the cooking liquid from the pot to a small bowl and add 2 tablespoons of flour and mix well. Try to mix out all the lumps. Add that mixture back into the pot and simmer for 10 more minutes. That should thicken it up. Serve with a big crust of bread, or with croutons, which is the way I like to serve it. 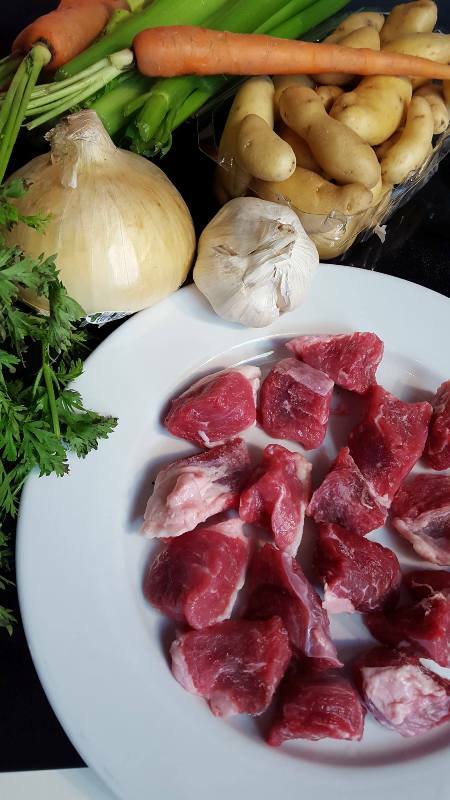 I think beef stew is the perfect comfort food for Autumn.